'Be careful with the Lyrica. It has a reputation of being very addictive for some people,' my son meant to write concerning my new pain medication. But autocorrect changed it to 'lyrics' and we both had a little laugh, agreeing I am much too far gone to kick the poetry habit. But then he took it further again, trying to persuade me I was not really a poet in the first place, not a born poet, that I was fooling myself as part of the addiction. That is what brain-washers do: they try to undermine and destroy your identity – which, if successful, leaves a person very vulnerable and malleable. The brain-washer then gives you a new identity – as cult follower very often; in this case I think obedient puppet was the aim. It didn't work. This time he was looking for 'no' answers. He ran out of questions. Instead of proving that I wasn't really a poet, he had me confirm to myself that I was ... am. When I look back, I am interested to note that the second lot of questions, which were supposed to lead to answers showing I wasn't really a poet, were not at variance with those which he had used to label me an addict. And my answers to both sets of questions were consistent. 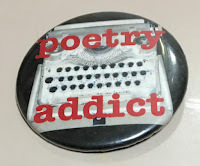 So am I both a born poet and an addict? No, I think the things that look like addiction are part of fulfilling something innate ... or at least so deep-seated, so ingrained, that it might as well be. I prefer to think of it as a vocation. You might rather see it as 'a calling' – or even, less exaltedly, an infection or disease! Or maybe for you it's a hobby, a pastime, a pleasant recreation, play. That's perfectly valid too, and as far as I can see still means you're a real poet. I do admit I am absolutely unwilling to live without it! Look, I even have a badge that outs me. (Obtained from Austin International Poetry Festival, Texas, 2006.) Evidently I am not the only one around! How about you? Are you 'real', addicted, vocational, playing, or all of the above? This might be my favorite Musings so far! Writing poetry seems to be a calling, indeed! Which then leads to the question of how you can tell a calling from an addiction? In my limited/intimate Quaker world, I say the answer is service to community and world--even if no one else thinks so (yet). An excellent distinction! 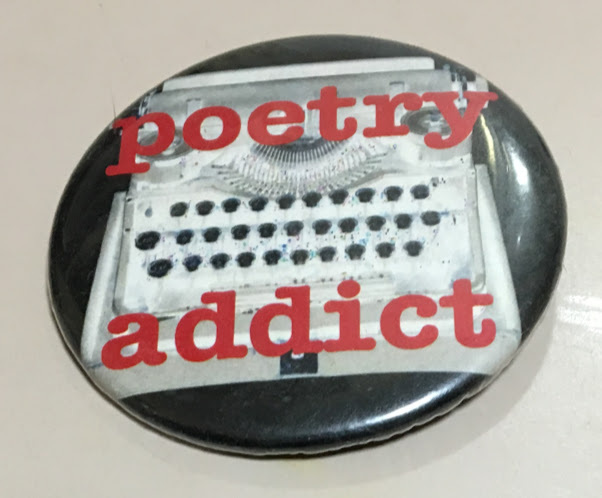 Also an addiction is generally regarded as self-destructive, and I do think poetry is healing and enriching to the poet too..
Susan, I really like the idea that writing poetry might be a 'calling," some kind of service. Perhaps the best of poetry is this! Dear Sumana, you absolutely can be called a poet now! And a very beautiful one, may I add. I want to kick your friend, and you know wear. You are an incredible poet!!! This piece is so good, and necessary --- to remind poets to reclaim their titles, and pencils. With friends like that... Don't worry, he's long gone. He did himself a disservice with that little exercise. I have always written. In busy young mom years, i felt bad because i only wrote sporadically, and knew i should be writing oftener. It was Poets United that got me writing steadily and productively for which i will be forever grateful. Writing, for me, is not an addiction, but is the best, most satisfying part of my day. It is what makes me feel fulfilled and productive. 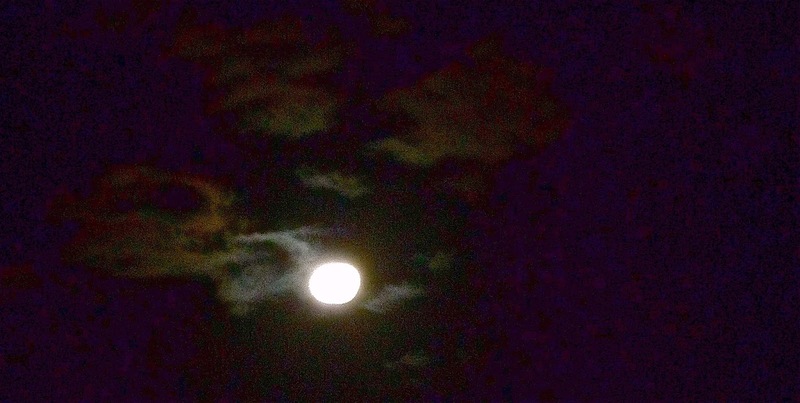 I love your Moonlight Musings, Rosemary. Oh yes, I remember writing in 'busy young mum years' (as we spell it here. How interesting! Canadians do US spelling? But I digress....) I remember that lines of poetry would come into my head and I'd have to hold them there, or sometimes a whole verse, whilst finishing the dishes or the ironing or whatever it was. With young kids you can't just stop and take time out to write; often that came late at night when everyone else was in bed. Just found a new label for it – commitment! It is just part of who you are rather than an addiction. That is the way you express your feelings and so be yourself. I think your friend was trying to belittle your activities because he felt excluded or threatened, So he didn't understand you. Thank you, dear Anonymous. You are undoubtedly right. Well it is as simple as this. The toxic person was jealous of your passion . Sadly too many want what they will never have and as a result need to destroy the other person.Seen this too many times. I hope there are young people reading this. They should know if someone makes the effort to destabilise and undermine you, then that is a sure sign and confirms that you must really be talented They would not bother otherwise. Dearest Rosemary, I'm in lust with this from beginning to end. Before I was even finished reading it, I sent the link to a good poet friends who needs reminding that there will be people like your old enemy in the world. The Lyrica thing made me laugh. Not just because it's supper funny, but because autocorrect might've had a case of the Freudian Slips in a different way. You see, when I was put on Lyrica ages ago--to treat nerve damage--one of the side effects was my muddling of words. It was such a strange feeling, to be thinking one thing but saying another, and noticing the mistake BUT not being able to correct it right away. Needless to say, it didn't work for me. About the poetry addiction, well... I might be biased. Still, to ask a poet if word-birthing interferes with her life is... dumb... and malicious. Dumb because we both know that writing poetry might not be exactly like breathing, but goodness it feels like it. We could stop and still walk around, but zombies aren't really alive. Also, the world might be a much more dangerous place if some of us were kept from writing. And I don't have to explain why I think it's malicious, you lived it. I love how you challenge us to say what we say more boldly, Magaly--here once again. Blessings on you, dear Reader! We need you too! Well, if I am honest, it used to be both an 'addiction' and a 'calling' for me. Now it is a recreation. I like to play with words. I think people who write for any of the reasons you mentioned, Rosemary, could be 'real poets.' A 'real poet' is someone whose words affect another in some way. Or even affect the poet himself/herself. To tell the truth, for me it is 'all of the above'. I think play is at the heart of it, and a very necessary thing for us all to retain past childhood. We can get too earnest about our poetry, and lose the joy in words with which we began. Great post! I really enjoyed the article, Rosemary, and thought that it was very well written. You make some good points, and the bits of droll humour that you've injected into the piece, truly add to it's 'readability'. For me, in order to qualify as an addiction, an activity must adversely effect mental and/or physical heath, detract from an overall sense of wellbeing and poison relationships that get in the way of pursuing the addiction. - enhances their perception of what is going on around them. Though I appreciated putting some thought to the issue! Thanks for this! And thanks for your excellent thoughts. Good points! An addiction is an obsessive-compulsion that negatively impacts our lives. A passion is a consistent positive motivation that positively impacts our lives, and (hopefully) the lives of others. Ah yes, you've nailed it. A passion – yes, that's what it is! Well he's not around any more, and people like you are, so that's good. Thrilled to be your drug of choice! i think we write because we love to, however cliched it sounds. i read through all those wonderful comments and there's certainly no reason why we shouldn't write. No reason at all! I would certainly miss your writing if you stopped. This was an interesting read. Am I addicted to poetry? I don't think I am. I feel I am passionate about life and I need a way to express that passion and poetry is my mode of choice. I once had a friend tell me my poetry wasn't very good, it crushed my soul for the longest time as I was trying to get published. Now, I write for pleasure when I have time or I have something I'd like to share with the the poetry world. Do I dream of getting published someday? The answer would be, yes. We are all poets in our own right and may that magic always enlighten us on our sojourn with words. I think pleasure is the best reason to write. (Or read. for that matter.) For the rest, depends what you mean by 'good'. Your poetry gives me and others pleasure, which may be a better yardstick than some current literary fashion. I do believe there is such a thing as 'literary merit', which transcends fashion – but I also think only posterity can judge that, and few of us will be around long enough to find out.